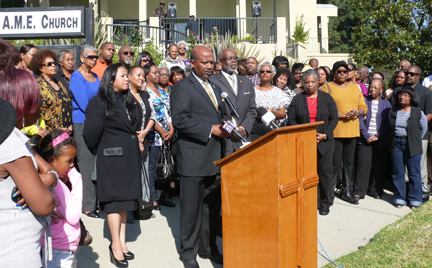 First A.M.E. Church moves forward After the stepping down of Rev. John J. Hunter, FAME fully intends to move forward as a beacon of hope for the community with new pastor, J. Edgar Boyd. 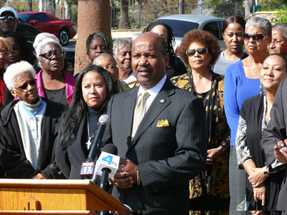 On Wednesday, Nov. 21, the First A.M.E. Church of Los Angeles’ new pastor, J. Edgar Boyd, along with fellow parishioners, met with the press to share with the public that “FAME rises.” Boyd stood poised and has already taken the helm to continue leading FAME as a positive influence in the community. FAME has recently had its share of trials and tribulations. Former pastor, John J. Hunter recently stepped down from the church amid scandal and misuse of funds. Boyd made it clear in his announcement to the media and public that he intends to continue in the tradition and the same spirit that the honorable, Rev. Dr. Cecil L. “Chip” Murray, established at FAME. “I’m here to help, I’m here to serve, I’m here to heal,” said Boyd. Boyd was assigned as senior pastor to FAME October 20 and seems to meet with the approval of his new congregation so far. Church members and First Lady, Florence Miles-Boyd, flanked the pastor with love and support. Many of them feel that the recent incident has led to a revival of the church and stand ready to take the next step with Boyd. Boyd’s Pastoral Assignments have included St. John A.M.E. Church, Pueblo, Colorado, 1971-1973; Pastor of Grace A.M.E. Church, Casper, Wyoming, 1973-1975; Pastor of Walker Chapel AME Church, Seattle, WA, 1975-1980; Pastor of Brookins AME Church, Oakland, CA, 1982-1986; Pastor and Bethel AME Church, Los Angeles, CA 1986-1992; Pastor of Bethel AME Church, San Francisco, CA, 1992-2012. He was appointed pastor of FAME, LA, By Bishop Theodore Larry Kirkland on October 28, 2012. “So far, from what I’ve seen, I like [Boyd] very much,” said FAME member, Arshell Qualls. “He seems like a very down-to-earth, hands-on guy. “It was important for our new pastor to begin to set the ground rules to identify anything that he sees that is out of order and to begin to put the house in order,” said FAME member, Carmen Hayward-Stetson. “I agree with [Boyd’s] position that it’s not about pointing fingers, or blame because we don’t worship any man. Recently, Bethel African Methodist Episcopal Church rejected the troubled Los Angeles pastor, Hunter from taking the pulpit. The presiding elder, Rev. W. Bartalette Finney Sr., urged Bethel members to focus on their personal relationships with God and not on the problems of the church. Hunter had been transferred from the FAME Church in Los Angeles to lead the San Francisco church. But in an unprecedented move, leaders at Bethel AME drafted an emergency resolution barring him from taking control. They stated that the reassignment could "impair the legacy, reputation, relationships and goodwill" of the church in the community. When asked about former pastor Hunter, members said that they would keep him in their prayers, while some offered no comment. First African Methodist Episcopal Church of Los Angeles is the oldest church founded by African Americans in the City of Angels. In 1872 Mrs. Biddy Mason (a former slave) received the vision from God to establish a church that would minister to the mind, body and soul of all who would join that small band of believers. That vision and small band of believers has grown to what is now a congregation of more than 19,500 members and several dozen ministries within 13 corporations that bless and reach tens of thousands of seekers in greater metropolitan Los Angeles.